It was in 2002 Daniel (Vocals) and Nuno (Guitar) went, with a clutch of songs in hand, in search of a bass player and drummer and joined forces with Rui (Bass) to form what today is known as ‘Happiness.’ For some time they were unable to sort out a drummer and so it was by using a keyboard that they did the rhythms. Actually, it was at that moment that the whole songwriting production began, and over the next two years a number of drummers came and went. 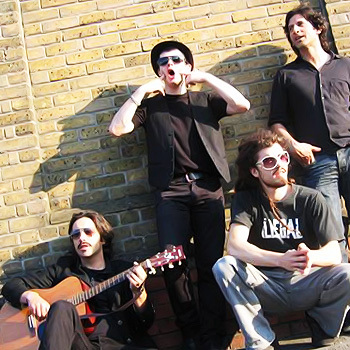 Claudio, the band’s first drummer, who would later disappear following an immersion in music and drugs, was followed by David Canhoto who helped the group gain a further structural dimension as a live performing band, and now Pedro Espirito Santo, the present drummer, following an invitation to do a studio session where new songs were worked. From this session ‘Final’ came about and it was as “if the flow was completely there, just like if we had been playing together for ages ”. Some years before Daniel and Nuno had got to know one another in the early hours of one morning at the end of a party with a few friends at a small seaside town. These were times of mutual learning and understanding for a group of young people where each found in the other an artistic compliment to enhance their individual talents. Daniel, apart from painting, wrote intensely and together with Nuno on guitar they began to compose music and pen songs almost spontaneously.